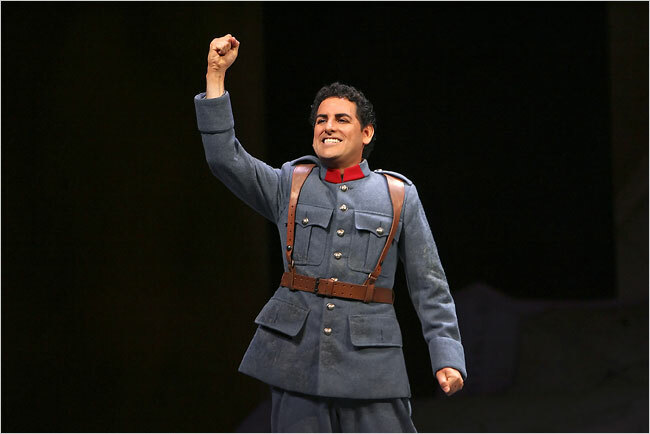 The highly successful second season of the Metropolitan Opera at the Movies concluded with Donizetti's La fille du Regiment, starring Natalie Dessay and Juan Diego Florez, two of the greatest bel canto singers of our generation. Peruvian tenor Florez is certainly at the height of his powers, his reputation as the best in the bel canto repertoire well nigh unassailable. On opening night a few days earlier, after prolonged and vociferous applause from a deliriously enthusiastic Met audience, he repeated "Ah. mes amis" with its 9 high Cs, for a total of 18. This was a break with the Met tradition - other than "Va pensiero" - a choral piece, no soloist at the Met have encored an aria for many, many decades. It was clear that Signor Florez is back and in terrific form. There were some trepidations regarding his vocal health, after a much publicized, month-long cancellation (late Feb. to late March) as a result of having swallowed a fish bone(!) that required a surgical procedure. It was to our great good fortune that the irreplaceable Florez have recovered completely from this accident, and is now singing as well as ever. He also put his hiatus to good use by marrying his German fiancee Julia Trapp in his home town of Lima, Peru at the end of March. His performance yesterday (April 26) was extraordinary in every way. Rarely have we heard such vocal ease, particularly his complete freedom at the top of his range, and his total command of the bel canto style. Besides the vocal fireworks in "Ah! mes amis", his legto and overall stylish vocalism in the "quiet" Act 2 aria was extraordinary. It was a performance to cherish. With such a high power Tonio, "la fille" had to be special, and French soprano Natalie Dessay fits the bill perfectly. After having sung almost twenty years at the highest level, Dessay has transformed herself from a specialist in the stratospheric soprano roles - Olympia, Zerbinetta, Koenigin de Nacht - to a somewhat lower fach that includes Lucia, Manon, Amina, even Pamina (these last two roles I heard in Santa Fe a few years back), and of course Marie. Melisande is another role that she has sung to great acclaim, a vocally non-flashy - completely lacking in high notes - but supremely effective acting vehicle for her. Rumour has it that a vocal crisis several years ago led to laser vocal cord surgery which necessitated the change in fach. She has actually discussed her vocal problems frankly with journalists. Now it appears that her problems are a thing of the past and she is once again singing beautifully. The voice has greater warmth in the middle and the top is secure, if not with quite the beauty of tone as before. And she remains a singing actress non-pareil. Her Marie was a spitfire, full of energy and spirit. Some might find it a bit too manic, but given the Laurent Pelly delightfully zany conception of the piece, her acting was spot on. More about Pelly. His previous productions - an incredible La belle Helene and an equally terrific Cendrillon - turned me into a fan. In my mind his La fille is a very fine piece of work but at a somewhat lower level. Perhaps it's me, but I find this French farce not all that funny, and musically it is rather thin, despite a few nice arias. Part of the problem was the excessive amount of dialogue, spoken in French - not all of it translated in the subtitles - that just didn't have the same impact on an English speaking audience. Thankfully with great singers the likes of Florez and Dessay, they managed to lift the musically lightweight material to a high level. On this occasion, they were supported by Felicity Palmer and Alessandro Corbelli, two veterans of the opera stage. Both acquitted themselves with distinction. The only downside was a singularly un-funny Duchess of Krakenthorp by Marian Seldes . Thankfully her contribution was reduced in this revival when compared to previous, more starry Duchesses, such as Montserrat Caballe, in the Vienna revival of this production a couple of years ago. Conductor Marco Armiliato is becoming more and more a Met fixture, and it is all to the good. He is a singer friendly conductor, and his work, though middle of the road, is always at a consistently high level. He brought much energy and verve to the proceedings this afternoon. The male chorus under Donald Palumbo sounded great. There was only one intermission feature, with the ever solicitous but totally predictable Renee Fleming interviewing the two leads plus Palmer and Corbelli. Dessay's English has improved by leaps and bounds, almost completely accent-free, except for her pronunciation of the word "character". The picture quality was once again on the dark side, likely limited by the projection equipment. I just hope this will be remedied as technology improves in the near future. Three cinemas were put into service at the Sheppard Grande. Despite a totally unexpected, last-minute transit strike, the cinemas were just about full. Likely patrons who had purchased tickets were unable to show up due to the transit strike. The transmission was once again glitch free. Now that the Met in HD season has come to an end, we can look forward to next season, with an expanded list of 10 operas plus a gala opening. I for one can't wait! 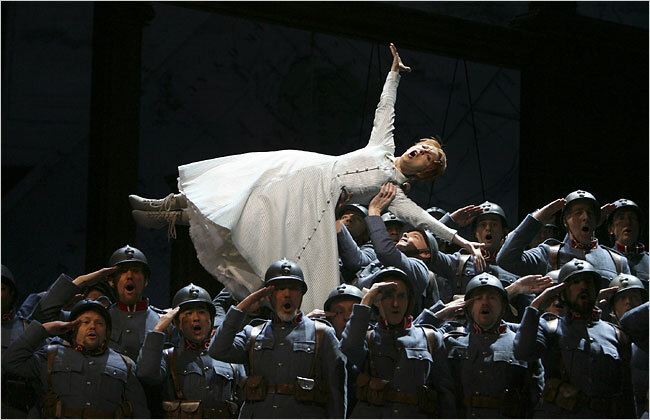 Today I went to see the second-time-around Met Opera HD film presentation of La Fille du Régiment. By way of preparation, I recently listened once again to my old LP of the Sutherland/Pavarotti/Bonynge/Covent Garden recording - of the 1960s, I believe (these old recordings are annoyingly deficient in such details). Two things struck me about this recording: first, the radiant voices of both Sutherland and Pavarotti at this time in their careers, and second, the attractiveness and sheer fun of the music. Of all the operas from which one may come away “humming the tunes”, this is certainly one of them. As for today’s Met performance – I’m seldom “blown away” by an opera, but this was the exception. Natalie Dessay was outstanding histrionically and vocally, and Juan Diego Flórez was splendid vocally as Tonio (it didn’t hurt that he was a gorgeous hunk). Everything else was wonderful too – the supporting roles, the chorus, the orchestra, and YES, the production itself. So often when opera producers give us their interpretation of an opera, I wonder whether they’ve read the libretto or understood the music. And one has to suspect that sometimes they’re massaging their own egos above anything else. With the Met’s La Fille du Régiment this wasn’t the case. It was an intelligent and sympathetic updating, or perhaps a refreshment, of the opera, while still keeping the spirit of the original intact. The soldiers in battle uniforms, Marie in a grubby T-shirt (an inspiration! ), ironing the regiments’ undies (an exaggeration, but it worked), peeling the potatoes, etc. – FUN, which is what this opera is about! There were also some witty subleties. Did you notice that included in the souvenirs the soldiers gave Marie when she had to leave the regiment was a potato (one of her jobs as cantinière having been to peel the potatoes)? When, some time later and living with La Marquise, she unwrapped these souvenirs, the potato was still among them, but had sprouted roots (I liked the teddy bear too). During the interval I bought a copy of the parallel Covent Garden production. I’ll have to come down from my high before viewing it, but I expect to be entranced once again. I agree with you that the Duchesse du Crackentorp was a weak link in the Met production. On the Covent Garden DVD she’s played by Dawn French, and excellent comic actress, so I’m expecting better things. I could say much more, but I think that’s enough.